The Bay View Resort offers amazing views of the Atlantic Ocean and miles of white sandy beaches as you enjoy a stroll along the Myrtle Beach Boardwalk. There are many restaurants, attractions and shops all within a 1-mile walk. As you celebrate dad on his special day, we thought we would help pick the top things to do for your father, here in the heart of Myrtle Beach. Enjoy a round of golf — or mini-golf: Dads everywhere love to hit the links and greens, and the Grand Strand is known as the Golf Capital of the World for good reason. Pick one of the top courses that he would love to play and join him, or if you are looking for a little less of a challenge pick one of the mini-golf courses along the Grand Strand. Take Dad to the ballpark: Enjoy America’s pastime with Dad on Father’s Day. The Myrtle Beach Pelicans will face off against the Carolina Mudcats at Pelican Ballpark this June 17, and family-friendly promotions for the day include Pre-game on-the-Field Catch; the inflatables, face-painting, and balloon artists that accompany “Ultimate Kids Sunday”; and Post-Game Fireworks and Kids Run the Bases after the final pitch is thrown. Put Dad behind the wheel — NASCAR-style: Talk about a great gift for dads with a need for speed! The NASCAR Racing Experience at Myrtle Beach Speedway lets Dad ride along or take the wheel for a few laps in a real NASCAR race car, all on a track built to accommodate high speeds. Catch some waves: For dads who have always wanted to hang ten, a private or group surf lesson (or multiple lessons) from Surf City Surf Shop is a great way to get Dad’s feet wet in the new sport. The North Kings Highway shop also offers stand-up paddleboard lessons and tours. Drop a line: Treat your fishing-enthusiast father to some tight lines from one of the Grand Strand’s Atlantic Ocean piers. Many of the piers even offer equipment rentals and license/bait sales for those who may have ventured to the coast unprepared. Pack in some paddling: If your Dad is the type who lives for a day on the water, the Grand Strand offers plenty of great places to soak in the scenery and enjoy some kayaking, canoeing, paddleboarding and other water sports, as well as abundant options for equipment rental. Splurge on a steak dinner: For dads who love a good steak, dinner at Greg Norman Australian Grille provides a fine finale to an awesome Father’s Day. Located at the Barefoot Landing complex just across North Kings Highway from North Beach Plantation, the restaurant is easy to reach — and as a bonus, you can share dinner with Dad while taking in sweeping views of the Intracoastal Waterway. Top off your big day with Dad by taking him back the Bay View Resort and sit and relax enjoying the views. 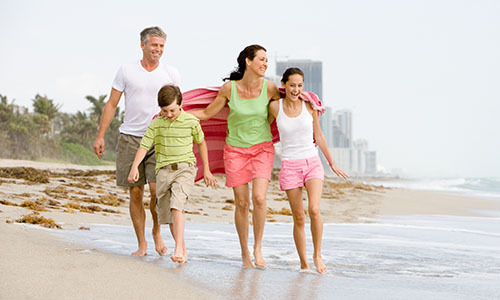 Book your Myrtle Beach vacation today — and get ready to show Dad his best Father’s Day yet on the Grand Strand!